On the 23rd of August 1966, Vincent Lingiari led 200 courageous Indigenous stockmen and their families to walk off Wave Hill Cattle Station in the Northern Territory protesting against the work and pay conditions. The Walk-Off took place 80 years after the British invaded Gurindji lands, bringing cattle and farming that destroyed Aboriginal water and food sources, and livelihoods. These 80 years included massacres and killings, stolen children and other abuses by the early colonists. Initially, the British pastoralists believed the workers would return when offered improved wages and conditions. But Lingiari had another vision for his people and wanted nothing more than the rightful return of their lands. The group walked some 30 kilometers from Wave Hill Station to Wattie Creek where they stayed in protest for nine long years. During the years of struggle and protest, which made headlines across the nation, Vincent Lingiari toured Australia to lobby politicians and galvanise support. Victory was achieved in 1975! At the time the Gurindji strike was taking place in Australia, the worldwide civil rights movement was in full swing. Whilst many Australians are familiar with Martin Luther King Jr and Nelson Mandela, the history of the Indigenous Australian civil rights movement and its heroes, like Vincent Lingiari, is still largely unknown in our country. Across the nation things were starting to change for Indigenous people. The Wave Hill Walk-off started just one year after Charlie Perkins led The Freedom Ride across NSW to protest against discrimination Indigenous people faced. And a year later, in 1967 over 90% of Australians voted in favour of counting Indigenous people in the census. On Australia Day of 1972 the Aboriginal Tent Embassy was set up outside Parliament House in Canberra. Australian people were starting to take notice and think differently. 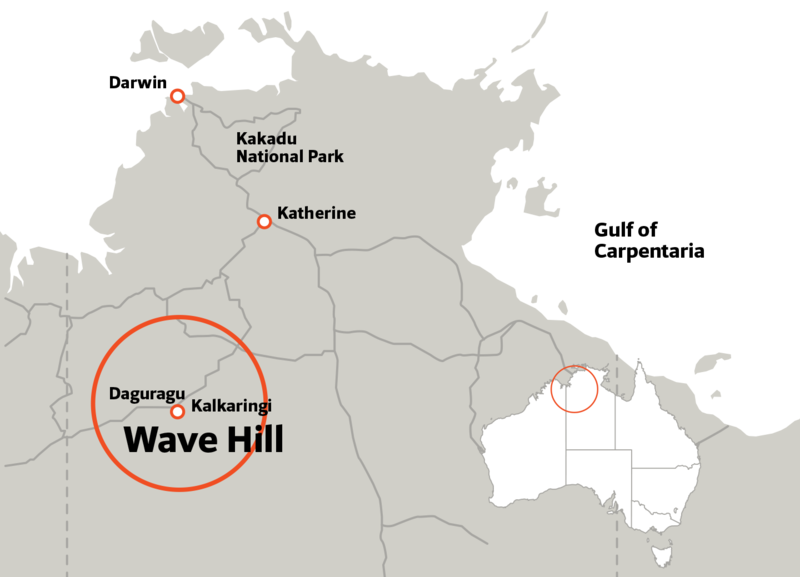 In the 1880’s British pastoralists invaded Gurindji lands and established the massive Wave Hill Cattle Station 800kms south of Darwin. Cattle and farming destroyed Indigenous water, food sources and livelihoods. Indigenous people were forced to work on the Station in order to receive rations and avoid starvation. In 1914, the Station was leased by the government to a large British food production company, the Vestey Brothers, who used Indigenous labour to increase the Station’s size and capacity. The working conditions for the Indigenous labourers were extremely poor; they rarely received wages, were beaten or even killed for defying the landowners, and the women were often terribly abused. On the 23rd of August 1966, Vincent Lingiari led 200 courageous Wave Hill workers and their families, to walk off the Station and begin their strike. The group formed a new settlement at nearby Wattie Creek (Daguragu). Initially, the pastoralists believed the workers would return with improved wages and conditions. But the focus of the strike moved from workers' rights to land rights. In 1967 the Gurindji submitted a petition to the Governor General asking for their land back. The petition included a map of sacred places on the land claimed and detailed the evolution of Gurindji myths and dreaming associated with these sites. This petition was unsuccessful. But, this is a great story of courage and resilience. Despite extremely difficult conditions, the workers and their families continued to strike. They did not waiver for nine years. While his people camped, and waited, Lingiari toured Australia to lobby politicians and galvanise support. The strike made headlines all over Australia. The campaign broke through racial barriers, with Gurindji people receiving support from workers’ unions and non-Indigenous Australians – financial, material and political. There was a readiness amongst non-Indigenous communities to stand alongside Indigenous people and demand justice. Today, Paul Kelly and Kev Carmody’s song is known across the nation, although fewer people know the story of the Gurindji strikers it tells of. In 1975, the Whitlam government finally negotiated a deal with the Vesteys to return part of the traditional lands to the Gurindji people. 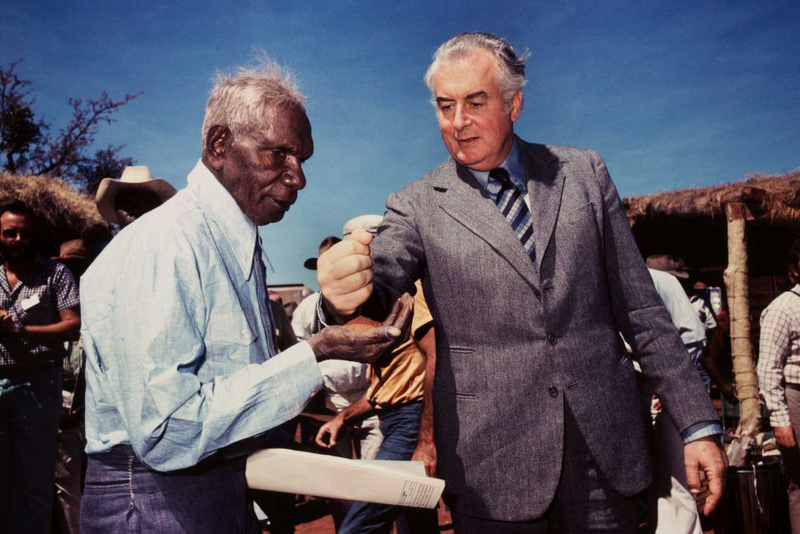 On the 16th of August 1975, Prime Minister Gough Whitlam handed over title to the land to the Gurindji people, by pouring soil into Vincent Lingiari’s hands. This has become a defining moment in Australia’s history and this period of time was the start of the land rights movement. In 1976, Vincent Lingiari was awarded a Medal of the Order of Australia. He passed away in 1988 and is remembered as one of the strongest and most inspirational Indigenous leaders ever. 2006, the Northern Territory government heritage listed the route of the walk-off. And in 2016, on the 50th anniversary of the walk-off, a track was opened to share the historic journey with visitors. Why is this relevant to every Australian? The end of Terra Nullius, the beginning of Native Title.